Cable reels, logs, planks of wood, benches, ropes and natural materials may have been what the educators saw, but through the eyes of our Little Forest Folk-ers, it was all so much more exciting than that; all week in the forest the children have been using their imagination to turn our loose parts into amazing constructions. These loose parts were moved around the forest, carried, combined, redesigned, lined-up, taken apart and put back together in multiple ways. These materials have no specific set of directions so they can be used alone or combined with others, it is always fascinating to see how they are going to be used by the children. When the children are playing with these loose parts they are developing their creativity, mathematical knowledge, problem solving skills, teamwork and communication all in a very natural way and we love nothing more than seeing the pride on their faces when a group of children excitedly run up to us, saying they’ve built the best thing ever! All week the children have been captivated with the materials available and have worked together with their peers and educators to build amazing structures. Of course, we had pirate ships that slowly appeared all over the site with several children pretending to be the captain of the ship and asking the educators to walk the plank. As the days progressed, the pirate ships became more and more complex and by the end of the week pieces of tarpaulin were being used as flags and masts. Occasionally educators had to be reminded that these were the children’s projects, not their own! The children also worked together to stack the cable reels and logs as high as they could, making a circuit of raised platforms. 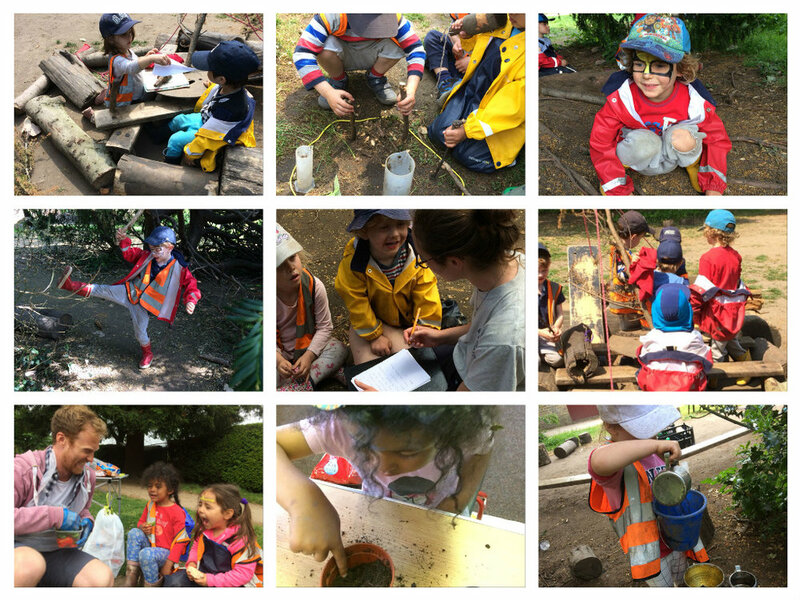 One of the things we love so much and try so hard to nurture in the children who attend Little Forest Folk Fulham is their adaptability and their continuous endeavour to challenge themselves. This was evident this week through their desire to change our normal obstacle course into something more difficult, and something they constructed themselves. They then navigated their way around the course encouraging each other to be careful and to take their time. The children were very proud of their efforts and would call out to the educators nearby to see how high they were and how well they were doing. The children have also continued to make parks for the caterpillars this week. This involved using the mallets they had made in previous weeks to hammer sticks and twigs into the ground, finding leaves or digging holes to represent things from the largest slide in the world to swimming pools. 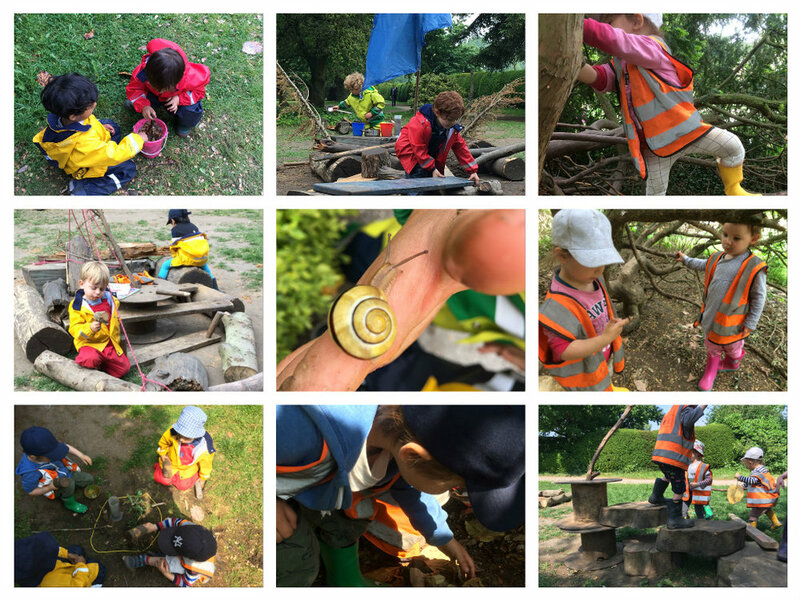 Rocks, grass and dirt became trampolines, trees and benches were made all for the caterpillars to rest on. All in all, it’s been a lovely week in the forest. We look forward to seeing some new faces next week for holiday camp and wish anyone going away for the week a lovely time.